Murtoa is a rural township in the Wimmera region. It is on the Wimmera Highway and the Melbourne-Adelaide railway, 27 km north-east of Horsham. Prior to being occupied by farm selections in 1872, the Murtoa district was in the Longerenong and Ashens pastoral runs. Settlers were attracted to Murtoa by the presence of Lake Marma, a reliable water source. Upon settlement taking place, the locality was named Marma Gully: its renaming as Murtoa occurred when a township was surveyed in 1873, and the name is thought to have been derived from an Aboriginal word meaning home of the lizard. Many of the settlers were of the German-Lutheran tradition. St John's and St Luke's Lutheran churches were opened in 1876 and 1883. A Lutheran school was opened in 1888 and the Concordia College for training pastors was opened in 1890, later being moved to Adelaide. Presbyterian, Catholic, Methodist and Anglican churches were opened during 1876-87. A government primary school was opened in 1873. Murtoa vied with Rupanyup for supremacy in Dunmunkle Shire. Whilst Rupanyup became the shire's administrative centre, Murtoa gained the railway connection: in 1878-79 the railway was extended from Stawell to Horsham via Murtoa, and in 1886 Murtoa became a rail junction when a line was opened to Warracknabeal. Rupanyup got a spur line in 1887. 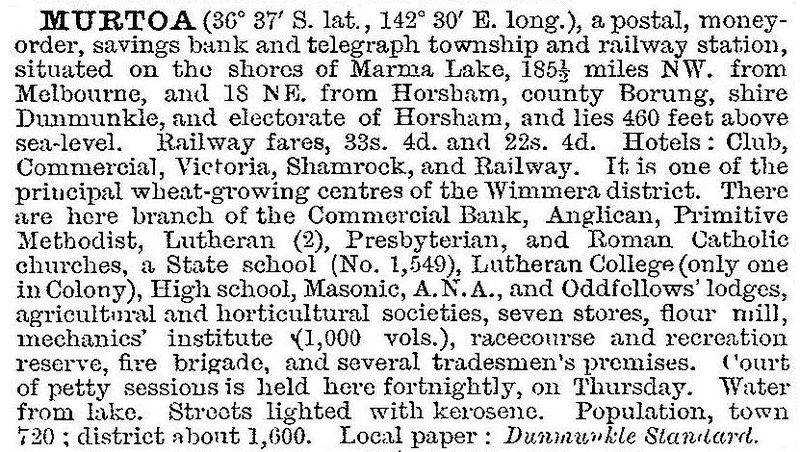 During its first decade Murtoa also gained a flour mill (1876), the Dunmunkle Standard newspaper (1878) and an agricultural and pastoral society (1881). A finely constructed water tower was built in 1886 for town water and for steam engines: it is on the Victorian Heritage Register and is used for museum purposes. A mechanics' institute was built in 1888. Murtoa has become a major wheat storage and freight centre, although livestock raising was sufficiently important for a carcass freezing works to be operated during 1911-24. During World War II, when wheat exports were suspended, large storage sheds were built at Murtoa and Dunolly. The Murtoa sheds, named the Marmalake Storages (1942) were 260m x 60m and 400m x 75m, holding a combined volume of 10.5 million bushels. Last used in about 1990, the remaining smaller one was added to the Victorian Heritage Register and described as a stick shed. The sticks are vast poles supporting the 19 metre high roof, giving the interior a cathedral like appearance. In 2014 it was added to the National Heritage Register. In 1922 a higher educational school was opened, and in 1956 it became a high school. A Catholic primary school was opened in 1963, continuing along with the Lutheran school. Murtoa's hospital was opened in 1944, and continued as a branch of the Dunmunkle Medical Service. During the early postwar years Murtoa's population approached 1200 persons, declining by about 200 by the 1970s, and by about 150 by the 1990s. It is still a substantial Wimmera township, with the three primary schools and a secondary college, four churches, golf, bowling and racing clubs, and a racecourse which has four meetings a year. Lake Marma is surrounded by a reserve with a swimming pool (1926), tennis courts, an oval and a caravan park. The public garden has an attractive fountain and band rotunda. The showground hosts an annual show in October. The flour mill which closed in 1977 was taken over for the manufacture of strawboard panels (from wheat stubble) and the freezing works building was taken over for a cabinet works in 1994. Murtoa College was formed by the amalgamation of Murtoa Primary School and Murtoa Secondary College in 2003 (281 pupils, 2014).